Or, get it for 67200 Kobo Super Points! This collection of life stories offers compelling narratives by individuals from different races, ethnic groups, religions, sexual orientations, and social classes. By weaving these engaging stories with relevant theoretical topics, this unique textbook provides deeper levels of understanding on how cultural factors influence identity, personality, worldview, and mental health. 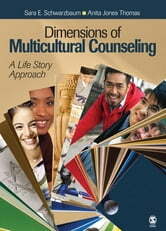 An Instructor's Resource CD with supplemental materials for each chapter and a helpful internet study site at http://www.sagepub.com/dimensionsofmulticulturalcounselingstudy/ including podcasts and videos offer further opportunities that examine and apply this mosaic of rich subject matter.